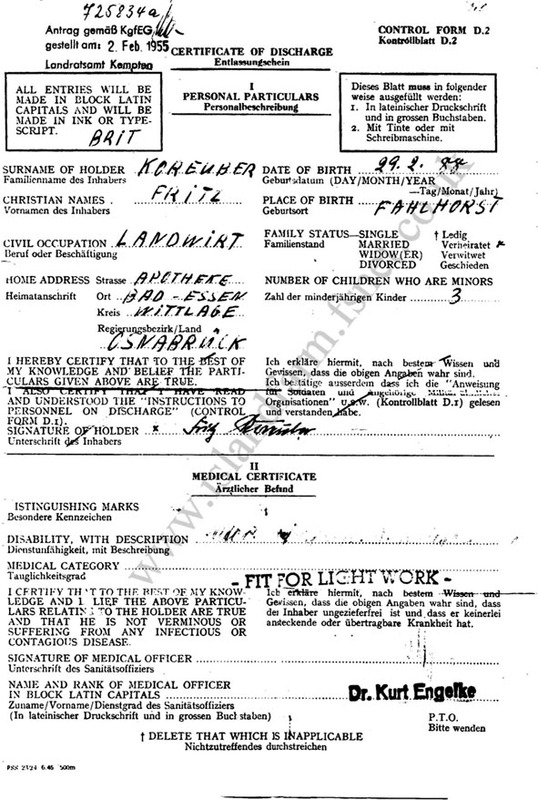 This profile is a translation of the applicable entries from a copy of Generalleutnant Koreuber’s original Wehrpass graciously provided by his son. Despite the best efforts of Shawn, a few of the handwritten entries relating to the early years of his career include abbreviations that have proven illegible or misunderstood. These unknown words, fortunately very few in numbers, have been marked with a line indicating a blank space. Parents: Karl and Johanna (née Russe) Koreuber. 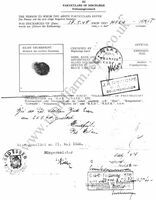 Wife: Married on 8 December 1941 to Marie (née Meyer) Kapellen (she had three children from a previous marriage). In 1943, Fritz and Marie Koreuber had one child of their own. 12 November 1909-6 August 1910: Detached to the Neiße War School. 1 October 1911-30 September 1913: Transferred to Luftschiffer [Airship]-Bataillon Nr.2. 1 October 1913-16 February 1914: Transferred to Luftschiffer-Bataillon Nr.5. 17 February 1914-1 August 1914: Transport Technical Test Commission. 22 April 1915-26 May 1915: Detached to the Radio Telegraph Course at the Navy Radio Telegraph School. 1 April 1915-14 May 1916: Transport Technical Test Commission. 15 May 1916-25 June 1916: Assigned to the crew of the airship LZ 102. 25 June 1917-31 July 1917: Transferred to the Inspectorate of Airship Troops. 27 September 1917-9 October 1917: Allocated to the Replacement Battalion of Airship Battalion 2. 10 October 1917-31 October 1917: Balloon Platoon Group ______. 8 November 1917-21 November 1917: ______ Airship Troop 5. 22 November 1917-14 January 1918: ______ Airship Troop 4. 15 January 1918-12 February 1918: Balloon Platoon 114. 13 February 1918-25 April 1918: Field Airship Battalion 18. 26 April 1918-23 October 1918: Transferred to the Inspectorate of Airship Troops. 24 October 1918-12 November 1918: Airship Experimental Battalion. 1 October 1919-18 November 1919: Defense (Abwehr) Office/Inspectorate of Airship Troops. 19 November 1919-13 December 1919: Inspectorate ______. 14 December 1919-31 December 1919: Reichswehr Balloon Platoon 1. 1 January 1920-14 November 1920: Reichswehr Artillery Regiment 1. 25 November 1920-3 August 1922: Transferred to the regimental staff of Artillery Regiment 1. 4 August 1922-31 March 1924: Transferred to Infantry Regiment 3. 1 April 1924-31 March 1927: Transferred to Motorized Battalion 5. 1 April 1927-31 August 1927: Transferred to Infantry Regiment 13. 1 September 1927-30 November 1927: Detached as a Rittmeister to Reiter [Mounted]-Regiment 18. 1 December 1927-30 November 1930: Chief of the 2nd Company (Württemberg) of Motorized Battalion 5. 1 December 1930-30 April 1933: Transferred to Medical Battalion 5. 1 May 1933-29 February 1934: Transferred to Transport Battalion 5. 1 March 1934-14 October 1935: Transferred to Motorized Battalion 3. 15 October 1935-26 August 1939: Transferred to Motor Transport Equipment Inspectorate I. 27 August 1939-9 September 1939: Army High Command Leader Reserve. 4 October 1939-10 November 1939: Army High Command Leader Reserve. 11 November 1939-31 January 1940: Commandant of Zossen. 1 February 1940-30 April 1940: Special Staff K (Kraftfahr = Motor Transport) of the Army High Command/Office Group K.
16 March 1941-25 February 1943: Commandant of the Zossen Troop Training Area in Wehrkreis [Military District] III. 26 February 1943-30 November 1943: Garrison Commandant of Vitebsk, Russia. 1 December 1943-14 May 1944: Garrison Commandant 282 (Vitebsk, Russia). 15 May 1944-1 June 1944: Army High Command Leader Reserve. 2 June 1944-29 April 1945: Commandant of the Zossen Troop Training Area in Wehrkreis III. 30 April 1945: Separated from the Army. 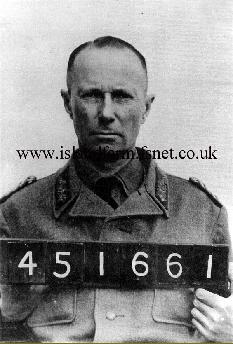 May 1945-17 May 1948: Prisoner of war in British captivity. 12th May 48 transferred to Camp 186 for repatriation. Prussian Iron Cross, 1st Class (1914): 14 January 1917. Prussian Iron Cross, 2nd Class (1914): 26 June 1915. 1939 Bar to the Prussian Iron Cross, 2nd Class: 17 June 1940. War Merit Cross, 1st Class with Swords: 20 February 1943. War Merit Cross, 2nd Class with Swords: 30 January 1942. Cross of Honor for Combatants 1914-1918: 29 January 1935. Armed Forces Long Service Award, 1st Class (25-year Service Cross): 2 October 1936. Armed Forces Long Service Award, 3rd Class (12-year Service Medal): 2 October 1936. Turkish War Medal (“Iron Crescent”): 16 November 1916. Bulgarian Bravery Order, 4th Class (1st Grade): 11 May 1917. This unique and rare badge was instituted in 1920 for award to the officers, non-commissioned officers and men who manned the German Army airships on tactical missions during World War I. 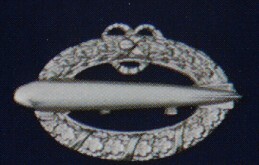 A similar badge, but with a Hohenzollern crown on top, was instituted at the same time for the German Navy airship veterans. General der Artillerie Helmuth Weidling, the Battle Commandant of Berlin who surrendered the city on 2 May 1945, was another recipient of this rarely seen badge. After serving aboard the Army Military Airship M IV on detached service to the Imperial German Navy, Oberleutnant Koreuber briefly served aboard the airship LZ 102 before receiving assignment to the crew of the LZ 101 commanded by Hauptmann Victor Gaißert. Transferred to the airship base at Jambol in Bulgaria, the crew of the LZ 101 flew one reconnaissance mission and 11 combat sorties in that theater of operations. 2 August 1914-31 August 1915: Security patrols with the Navy aboard the airship M IV. 1 August 1916: Transfer of the LZ 101 to the Balkans. 26 August 1916: Reconnaissance over the Black Sea. 4 September 1916: Attack on Bucharest and Ploesti (Ploieşti), Romania. 25 September 1916: Attack on Bucharest, Romania. 5 October 1916: Attack on Ciulnitza (Ciulnita), Romania. 24 October 1916: Attack on Fetesti (Feteşti), Romania. 25 December 1916: Attack on Galatz (Galaţi), Romania. 19 February 1917: Attack against Mytilene on the Greek island of Lesbos. 25 February 1917: Attack against Jassy (Iaşi), Romania. 20 March 1917: Attack on Mudros on the Greek island of Lemnos. 25 April 1917: Attack against Lemnos. 6 November 1917-15 November 1917: Positional warfare before Verdun. 16 November 1917-3 December 1917: Battle in Flanders. 4 December 1917-15 January 1918: Positional warfare in Flanders. 22 February 1918-25 April 1918: Positional warfare in the Champagne. 12-16 September 1939: Combat at Zamosz. 17 September 1939: Combat at Kulikow and Zolkiew. 17-20 September 1939: Combat at Tomaszow, Narol and Krasnobrod. 23-25 September 1939: Combat at Tomaszow-Krasnobrod. 1 May 1940-9 May 1940: Employed in the operations area of the 6th Army on the Western Front. 10 May 1940-31 May 1940: Participated in the breakthrough to the English Channel as well as the battle in Flanders and Artois. 5 June 1940-25 June 1940: Participated in the Battle of France. 26 June 1940-11 July 1940: Participated in the securing of the Demarcation Line. 17 July 1940-15 March 1941: Participated in coastal defense on the French Channel and Atlantic coasts. As the Garrison Commandant of Vitebsk, Russia and later Garrison Commandant 282, Generalleutnant Koreuber was employed on the Eastern Front in the operations area of Army Group Center from 26 February 1943-14 May 1944. Class: The M IV was a semi-rigid airship of the Groß-Basenach type built by the Prussian Military Authority. As a pressure airship fitted with a central keel, the M IV did not have gas cells. Instead, the gas was stored in a “Ballonet,” an air-filled compartment inside the main envelope that was kept pressurized by a blower or other such devices. Class: The LZ 101 was one of 12 airships of the “q” class first flown on 21 December 1915. A young Fritz Koreuber with a fellow member of Eisenbahn-Regiment Nr.2 identified only as Starke. Oberleutnant Koreuber served aboard the Army Military Airship M IV (pictured here in 1914) from 2 August 1914-21 April 1915. The crew of the Army Military Airship M IV poses with their ship. Officers and non-commissioned officers of the crew of the Army Military Airship M IV pose for a formal portrait in mid-1915. German and Bulgarian officers celebrate the birthday of Kaiser Wilhelm II with a song and some horseplay at Jambol, Bulgaria on 27 January 1917. German and Bulgarian officers celebrate the birthday of Czar Ferdinand I of Bulgaria at Jambol, Bulgaria on 27 February 1917. German Army airship crew members fire a machinegun during a ground practice session. Officers and men of the German Army airship detachment bow their heads while a chaplain conducts a memorial or church service inside the giant airship shed at Jambol, Bulgaria. Hauptmann Fritz Koreuber (second from right) attending captive balloon observer training at the Field Airship School in Courland, 1917. Another view of the captive balloon observer training at the Field Airship School in Courland, 1917.